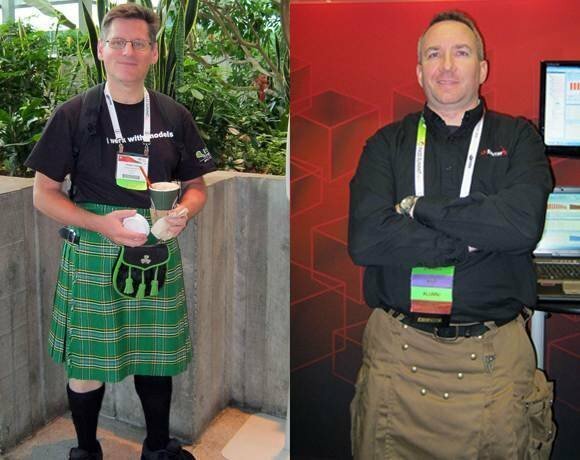 LEFT: Robert Volk, a database administrator at Planet Payment Inc. in Alpharetta, Ga., wears an Irish-themed kilt at PASS Summit 2011, the conference hosted by the Professional Association for SQL Server. Volk said he saw guys wearing kilts at last year’s conference in support of the PASS Women in Technology interest group, so he debuted his at a SQL Saturday training event back home in Georgia. Volk said wearing the garments is a great way of making people aware of the dearth of women in science and technology.